Dive into the elemental sanctuary of sun, sand, water and forest to harness the power of your breath and replenish body, mind and soul. 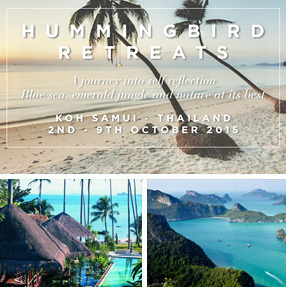 Rejuvenate with Hummingbird Retreat, Kamalaya Koh Samui: Arrive morning of 2nd October; Depart afternoon 9th October 2015. Amongst the jewelled archipelago of Thailand’s south east coast, Koh Samui is a most beautiful Island. This October, the Hummingbird Retreat will nestle amongst green jungle and golden sands to immerse in the organic luxury of Kamalaya Koh Samui (winner of AsiaSpa Awards 2014; Luxury Travel Magazine Gold List 2014; World Spa Awards 2014; Spafinder Wellness 365TM Award 2013: Best Eco-Spa). Cleanse, activate and evolve with meditation, Qigong, Oriental medicine, yoga, Kirtan, delicious meals and beautiful accommodation. Experience the art of Yi Jin Jing, an authentic form of Qigong, blending breath, meditation and movement. Rejuvenate with deep meditation, guided by Taoist healing techniques. Detox or just nourish with great food (nutrition consultation provided with a complimentary assessment by Kamalaya’s experienced naturopaths). Cleanse and activate with an emotional detox: specialty laser-acupuncture designed to clear away unwanted patterns of cellular influence. Nurture with evening yoga, Yoga Nidra, Vedic inspirations and Kirtan (mantras). Kamalaya scheduled daily fitness holistic activities and the use of Kamalaya’s Shakti Fitness Centre, lap pool, leisure pools, plunge pools and steam caverns. Non-refundable after 31st August 2015.